Virat Kholi’s splendid response to Manushi Chhillar’s tough question proves why he is a modern day great! Virat Kohli mesmerizes all of his followers with a splendid answer to Manushi Chillar's tough question at the Indian of the Year 2017 Awards! When two people who are representing the country internationally meet, everyone will obviously talk about it. On one hand, we have Virat Kohli, the Indian skipper who made his international debut almost a decade ago, and has been nothing but consistent with his ability to score. The Indian team captain has been breaking records all throughout his career, and when it comes to having the most centuries in ODIs, he is only behind the living legend Sachin Tendulkar. And then we have Manushi Chhillar, who made the whole country proud by bringing home the Miss World crown after 17 long years. When both of these icons met at an event recently, Manushi had a very important question for the Indian captain, Virat Kohli.. 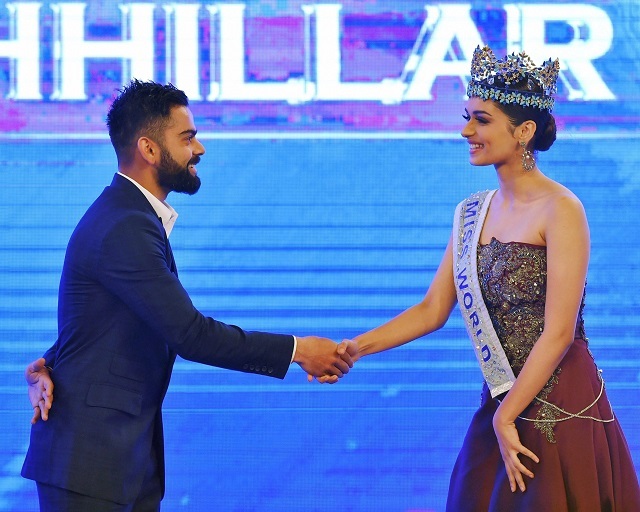 While attending the Indian of the Year 2017 Awards, the recently crowned Miss World took the opportunity to ask Kohli how he continues to inspire everyone. Whether it is on or off the field, he always knows what to do and say. And it’s no wonder Virat is a huge inspiration for the youth of the country. Virat Kohli also went on to present the ‘Indian of the Year- Individual Special Achievement’ to Manushi Chhillar. And it seems like the pictures of them together are the only thing people can talk about right now. Mother & Daughter Make Acting Debuts In Tollywood!